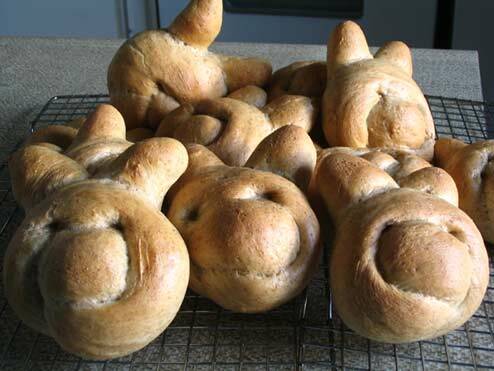 Here’s a great project if you have kids, or just want to have a bit of fun…..Bunny Bagels! The recipe uses our basic home made bagel method and ingredients but with a bit of a twist. Admittedly, not all of your bunnies will be cute and lovable, but the kids will love them anyway! For fully detailed step by step photographs of the bagel making process refer to our Easy to Make Bagels recipe. You can make ‘bunny bagels’ using any of our bagel recipes. Mix together one third of the flour and all of the yeast in a large bowl. Add the sugar and salt to the warm water and pour over the flour and yeast mixture along with the egg and oil. Beat together using an electric mixer on low speed and then switch to high speed for three minutes. Add as much remaining flour as possible by mixing in with a spoon. Turn the dough out onto a lightly floured surface and knead, mixing in remaining flour to make a moderately stiff dough. Knead for at least 15-20 minutes and then cover and allow to rise for one hour. Put water, oil, and egg into the workbowl of the breadmaker and then add the dry ingredients, ending with the yeast. Set machine to ‘Dough’ cycle. Place dough on a lightly floured board and knead to remove large bubbles in the dough and form into a roll. Divide into ten or eleven equal portions and then roll each piece into a 14″ (35 cm) length. Bring the ends of the roll together and twist as shown in the photo below, to form the rabbit-ears.